Wow I scored pretty good today!! June 16th, 09 Wow guys I scored pretty big today either that or i've lost my mind! 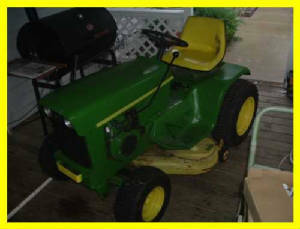 !.I bought 3 more john deere's today not just any ole john deere's either all 3 are pretty rare 2 of them are even already restored.I'll explain it all as you look at the pics.I am so screwed for room now i've got to get a grip this buying stuff and not selling has finally got the best of me.I've got 3 on the back deck all the sheds are full my garage is a nightmare I definitly will have to turn some loose but that decision will be very hard for me I love them all.I couldn't get very good pics today because it rained all day.I'll get better ones as soon as it clears up. 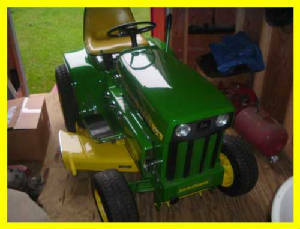 The first JD is a 1969 John Deere 110,she is all done and has a brand new motor on it,not a rebuild mind you a new 8hp. K181S Kohler!. 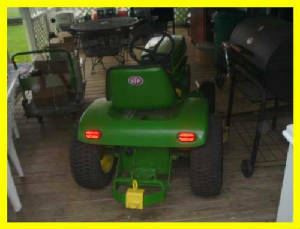 The one below is my john deere 112.This also has a new motor on it,a brand new tecumseh HH100. This is a 1968 John Deere 110.This one is not restored but i'm more excited about this one than I am any of the rest of them.This has the rare hydro lift with the hitch on the back,this setup is a real hard beast to find.Check out the headlights also. 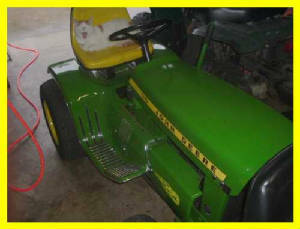 1968 John Deere 110 Hydro Lift.